When planning your deck, consider the space you have to build it in. Is your backyard large, small, or maybe irregular? 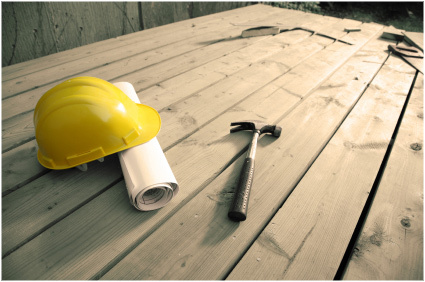 With a small backyard, double-check your local building codes about setback requirements for your property. Design-wise, consider a multi-level deck that makes use of vertical space. The lower level could become a convenient storage space or patio. But remember, grills should not be used under decking areas due to ventilation and fire hazards. If you have a lot of space, anything's possible - multiple levels, pergolas or gazebos, sweeping curves and more. Large yards can be split into different activity areas - like a garden, a grilling station, a pool, etc. An irregular space actually gives you the ability to create curves lets you work around any obstruction, and easily maximize your space. What you thought were useless areas can become perfect nooks to enjoy your time outside. If you want the option to enjoy both sun and shade on your deck, it's crucial to build it in just the right spot in your yard. Consider the shade-providing tress your space may already have, or think about adding a pergola or a gazebo to create a shady spot. Sometimes people have a wooded lot or a favorite tree they'd like to keep when building a deck. Trex can easily create curves and work around existing trees - so you can keep their natural shade. Beyond adding a shaded oasis, these structures add drama to any outdoor space. Our broad range of decking and railing is a beautiful choice for these added structures. The ins and outs of your deck. Often, a deck is connected to a home, but you can put it anywhere you like. Maybe your home has several potential entrance points to your deck. Multi-level and/or wrap-around deck configurations work well if you want to be able to step onto the deck from upstairs and down-stairs. If you have a second-story deck, multiple staircases usually work best. Sometimes your property will limit access to your deck to just one point off the house. So where should it be? Placing your deck off the kitchen area is a very popular option. This makes entertaining a manageable inside/outside affair. Some homeowners opt to build their deck off of a bedroom. For single-story decks, low trainsitional stairs can help make a deck feel more expansive. Where would you like people to sit? Would you prefer a railing or bench seating built into the deck? Railing is not only attractive, it protects kids, pets, and accident-prone guests against falls from higher decks. Be sure to check with local building codes about railing requirements. Some codes require railing if the deck is a certain height off the ground and may require that the railing be taller or shorter than standard lengths. Custom designed deck bench seating is a very easy and attractive way to add more seating to your deck. If your property provides little in the way of privacy, consider placing your deck off the back of your home. Decorative railings, planters, and gazebos can help create a more secluded feel. Take advantage of a naturally secluded yard by building your deck rigth into the landscape. Keep in mind that a deck built under trees becomes the landing spot for fallen leaves, twigs, nuts, berries, and occasional bird droppings - which will require more work to keep clean. Simple care and cleaning will keep your deck looking great for years to come.